I just wanted to do an update on LDIS. In this press release they say they want to get a liquidation from between $.93 to 1.20 per share. This is right on the back of a Nasdaq deficiency notice for a low share price and it requires that the share price must now trade at $1.00 in the next 180 days or it could be delisted. 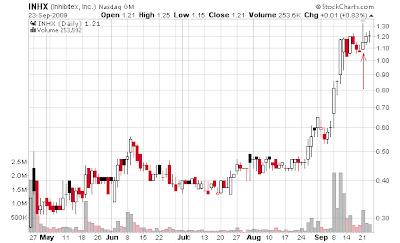 I first noticed LDIS when it was at $.73 back in July. I can't seem to find a net-net I like that doesn't do well lately. 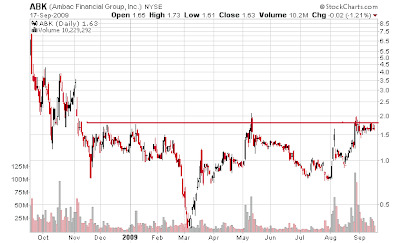 Even net cash stock ACTS from awhile back has performed well. As of right now I'm not going to buy LDIS. I sold INHX at $1.21 today from a $1.20 buy because I got a bad feeling about this action the past several days. They got some media? coverage I guess on a Seeking alpha article and a $2 target by Zacks. The thing I didn't like about that was it did boost the price into that breakout I was looking for but it looked like a bull trap and nasty shooting star to me plus I've got some back to back winners and taking a commission scratch on this one will probably be some good risk management that I need. It is still looking strong but I'd just rather buy the next big break if it comes. Existing home sales fell very unexpectedly it seems. I'm a day late in catching this perfect set-up but I think there will be some continuation. Maybe a lot of continuation. When I first saw the candle the arrow points to I thought it was a pure shooting star but it is more of a doji which is just as ugly being at the top of this chart. These two spike days back to back look very bearish plus that half shooting star/doji, plus the fundamentals. I'm hoping for a pull-back so I can get long UltraShort Real Estate ProShares (SRS). If it gaps down I might go long to. The risk of taking this trade for more than a day or two is there is good support at 11.00 to 11.20 in SRS(the line) and it will probably bounce around before another big move. ABK's consolidation here around resistance is forming a nice looking triangle. It's congesting right around resistance which is very bullish. Add that healthy consolidation and this is a good set-up for a buy here on any pop in price. Especially on heavy volume over 1.81. I'm going to front run it and nibble on it here today. These are the kind of set-ups(triangles) that have been working so well lately. ABK really gave off some easy signals to read in hindsight. 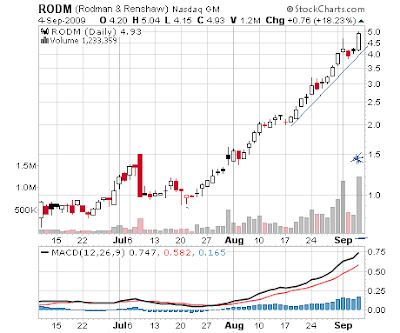 There was a hammer at the bottom on 8-17 and a doji off that recent consolidation. full disclosure:no position at time of writing. Order pending. I sold ABK at 1.90 because it popped huge just like I expected. My cost basis on ABK was 1.67 so I did about 13% on it. I'm up some in KEME and INHX I'm about breakeven. INHX if you've been following me has been great if you could have gotten some off the 1.08ish bounce that I was looking for. I messed up the order and got a 1.20 buy fill the other day for INHX. INHX and KEME are ascending triangles. 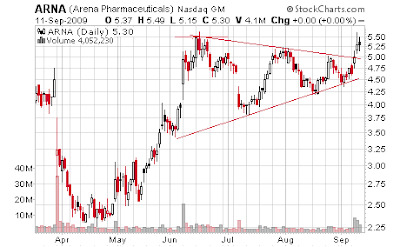 INHX is a drug stock so I am not the most confident there will be a nice pop but it is looking good so far. I could have sold at 1.30ish but I'm swinging these until the price action occurs at the tip of the triangle or I stop out. So far I'm really happy with the success of this consolidation pattern(triangles), especially recently. I think from now on in up-trending overall markets this will be a great swing trading strategy for me. The stop loss is easy to place and the volatility off of the consolidation pattern produces nice runs like an NCT for example. DITC is a value stock right above net current asset value I am liking the price action of right now. You might want to just bookmark and check the blog every morning to catch fresh posts. For me atleast Feedburner email posts tend to be late a lot. I get my own posts with email feed to make sure the feed keeps working ok and sometimes the posts will come in up to one or two days late. I'm going to boast a little on how well stocks I put up on this blog have done lately. I'd imagine if you all were watching these you might have commented. But then again since I started to find my groove these past few months in many different strategies I guess great picks are more common now. Boasting how well my watches do probably gets a little old but this past week has been amazing as you are about to see. I'll cut down or cut out the praising my own picks in the future. If your new to the blog or are passively just reading I just want to give you the heads up. I find winners in all types of markets. Bull or bear. Unlike other pure value investors who are sucking their thumb right now trying to find potentials. My financial picks from the other day which included GNW and HIG among others did amazing if you saw that. I mentioned NCT in that post just yesterday and it was one of the top gainers today 20% gain along with SPDE. Remember SPDE? SPDE was up 118% today! ARNA was in that watchlist to and it was up big after hours today. Both of these stocks ran after triangular consolidation. I knew ARNA was a good watch because of how it has run in the past. It likes to squeeze shorts too. 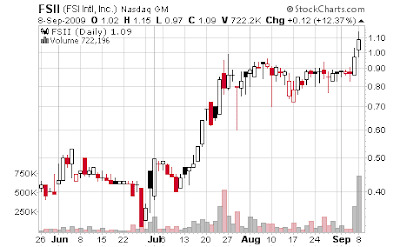 ARNA was the stock I predicted and won Timothy Sykes price target contest with. EDIT: apparently, Greenbackd comments section posts newer comments at the top of the comments where I never expected them to show up. Disregard the next paragraph. 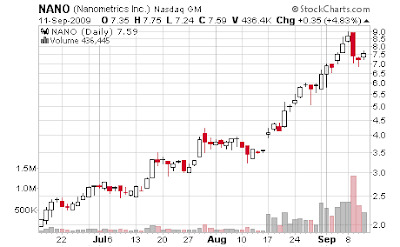 The stock watchlist I put up the other day when financials were at technical support levels has done pretty good. Actually really good. 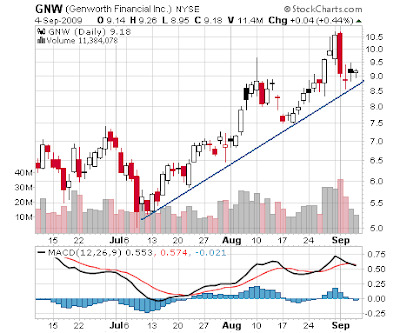 GNW since that list ran from $9 to $13, 40% run. HIG is over $28 now. RAS took off. 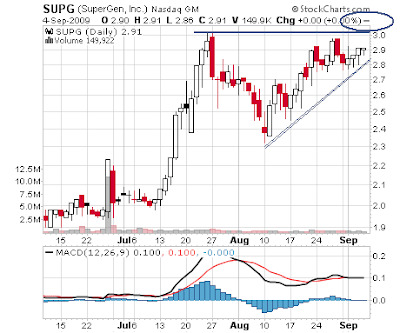 SUPG is breaking out a little here. 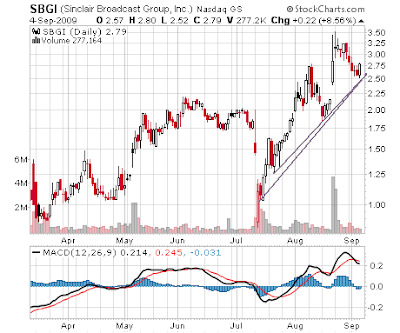 SBGI is up a $1 to $3.80. I put that list up because financials had flagged down and if the run was going to continue those were some of the best financials to try and trade the possible move with. I'm sure there are some compelling fundamental reasons institutions are accumulating them. I don't really care because I can just see their footprints. 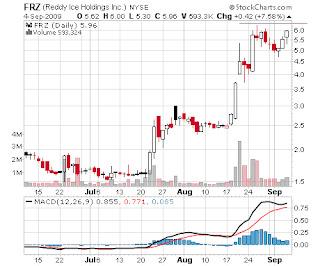 FRZ and KEME are still consolidating. 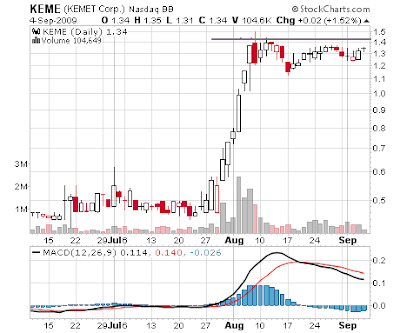 I'm still going to keep an eye on KEME and SUPG. NCT is breaking out. 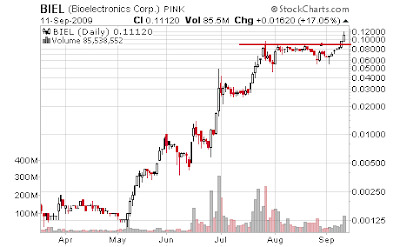 I'm long INHX and am looking for a breakout. It's slowly moving up with higher highs. I didn't get the price I wanted. I wanted a conditional trigger buy if it fell to just over $1 at 1.08 but I got filled at 1.20 I think. Still will be good if it breaks out. It sure has found support right around $1 these two days though. Caribou beat by $.10 at the beginning of the year and had decent numbers in that hellish economy. In hindsight I guess that was one of the fundamental buy indicators. I was onto the stocks breakout but never bought any shares to hold. They have been upping guidance pretty consistently lately and I believe right now are guiding for $.38-.39 next full year. With the stock at $7.50 that seems about right at a forward PE of around 20. The reason I am bringing up CBOU again though is I stumbled upon a coupon in the local newspaper advertising section for Caribou Coffee. What really surprised me was that the coupon was for buying their beans(or ground coffee beans). It said they were "available at a local grocery store near you." This is very good for the company and their brand. For years they have had independent reviews that ranked their coffees,especially their light roast coffees higher than competitors like Starbucks. For some reason over the years they had been slow to sell their coffee in stores. Wholesale businesses getting coffee directly to consumers from other stores are what has propelled Diedrich Coffee (DDRX) from $.40 this year to $25. I probably had been saying that in my older CBOU posts. I knew it to be true since 2005 before Caribou started the aggressive turnaround. What selling more of the coffee in stores means to me is it can act as a cushion around store operations because of its profitability, allow more consumers to find their brand, and possible allow for more upside surprise in EPS. 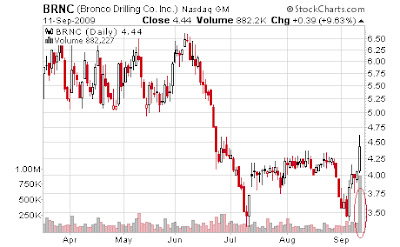 Huge volume spike on Bronco Drilling Friday. This ran to 5.40 after hours. Their balance sheet has been improving quarter by quarter. Looks a little like a failed signal on the triangle breakdown. That sell-off went nowhere and it bounced back nice. Looking for volume to come back and big pop very soon. I think ARNA has phase III results soon. 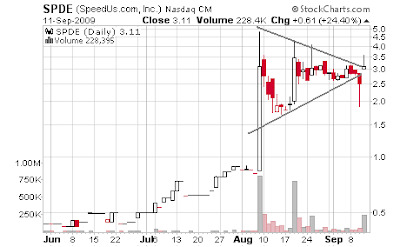 Nice volume spike and looks like clean breakout in works. Could just take off. Hammer right up at resistance. Looks bullish. Possible this was a bull flag. ZRBA is no longer going to do the liquidation and put out a press release yesterday they are exploring strategic alternatives. I'm holding from about $3.90 and the stock popped up to $4.97 and I just sold at $4.66. The way this thing has traded on news in the past is it runs big first day then because know one trades this stock it falls off the next day. Whoever comes in with size will probably do this again and I can't afford to wait however many months, years for a bid on this company to possibly come in right now when I have a big profit margin in my face and the information I mentioned above. 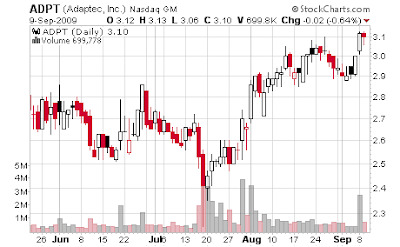 ADPT had a big volume spike the other day when it ran over resistance. This was a good entry point and see how it bounced off support in the upper $2.80s where I liked the stop loss just below? I don't BS with these stocks. Especially net-net's. This set-up is still here. It just tested support(former resistance) and could just breakout or consolidate again. A new entry would be best on a breakout I feel because the best stop off of a new entry isn't to clear to me. 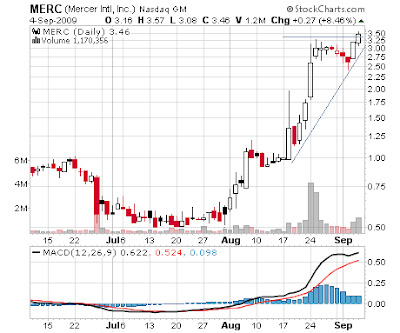 A stop loss for a breakout entry over 3.13ish would be 2.95. PGV is back in play. This thing loves to run. DEAR is in play and is a bank so you know what the appetite can be like for a stock like that. Huge run though. Would be surprised to not see some consolidation. 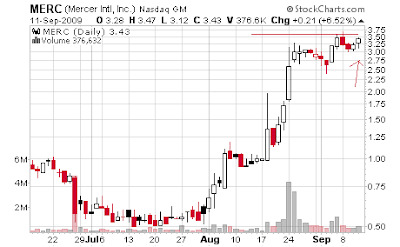 These stocks I just throw up on watchlists are ideal for daytrading and are just watches. If I do an entire post on a stock I really mean business on it. 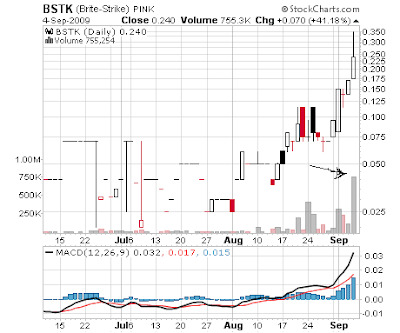 BSTK from the other day ran 90% that next day. I longed FSII. I'm just looking for 8% or so because I'm chasing it and I'm going to use a mental stop loss if it breaks this trend line on any decent sell volume. Click on these pics to get a bigger image. EGMI's trend I drew up has held up as it has bounced nicely off it. It's really amazing how much information the market will give you if you look at it. 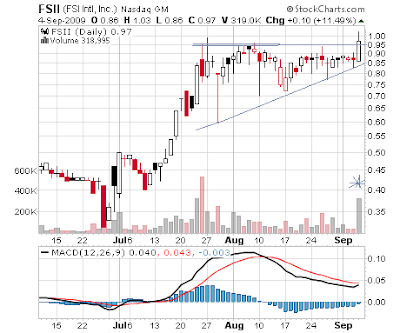 On the first pull-back volume decreased on this stock until it bounced off trend line. Similar on this second pull-back where I drew the down arrows. This last time though all the sellers shook out in a crescendo and it made a bullish engulfing pattern. I first found this net-net at around $.60 and it was at a big discount to net current asset value. 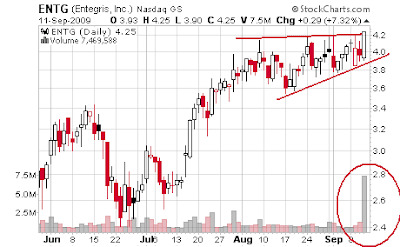 I put it on the stock watchlist Monday because it broke out of a triangular consolidation. It's slightly over NCAV of $28 million now at over $1 a share. Huge volume today. 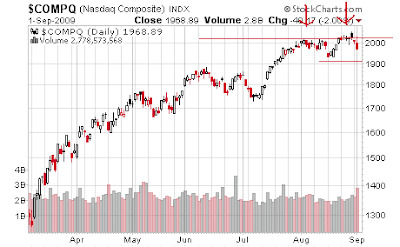 The financial sector has bounced off an important technical level on light volume. XLF, the sector ETF printed a hammer Friday which could be bullish. Anyway, these are a handful of stocks that stood out to me technically and have some momo going for them for potential quick trades. 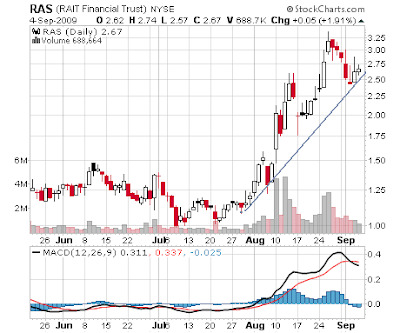 RAS flagged and bounced real well. GNW same but trend line a little more defined. 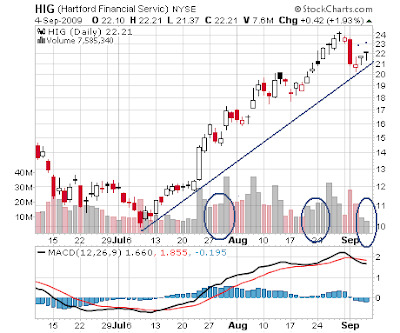 HIG two hammers back to back off trend line. This chart looks the best out of these financials as far as technicals with the two hammers and clean trend line. Just needs volume to follow through again or a move over Fridays high. 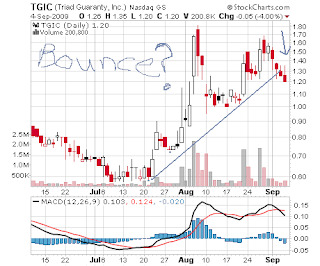 TGIC seems due for a bounce. Trying to hold uptrend. Last time it congested around trend line before run. Nice consolidation. Looking for breakout. Former deep value FSII continues to impress. 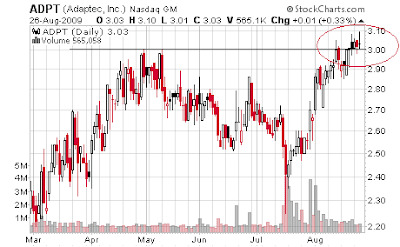 Nice volume on this tech stock. Should be a good watch list for some good moves if the runs continue. My technical bull call from about a month or so ago on the major indices has been right on. 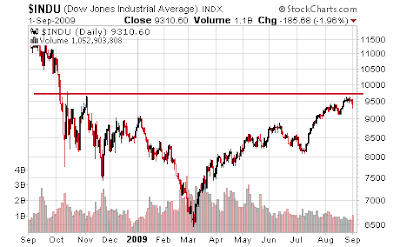 Around Dow Jones 9,500 was some key resistance. Dow Jones 10,000 would take out some good resistance levels and about be confirmation of a technical bottom. It looks like this is going to be a struggle with these fairly valued valuations. I had no idea what the fundamentals and economics was going to look like a month ago or even four months ago. Fundamentals and valuations are powerful I feel and know to. It's a fact technicals can only go so far. Economic reality is a powerful slap in the face. 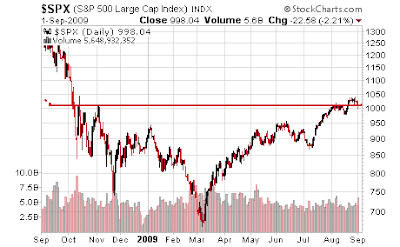 In that last link you can see how the overall stock market started breaking down technically when valuations were at historic levels in the tech bubble nine years ago. People were blinded by the "new age" of technology and valued stocks as if they could grow profits beyond the possible. Once the technicals matched the fundamental picture that was the time to take profits and get short. If the economic data stays about the same going into the fourth quarter 2009 and 2010 and GDP adjusted for stimulus stays pretty crappy its an easy short in my opinion on overall fundys. I think these valuations are getting to optimistic and we are about fairly valued here. There is the possibility that the run continues hoping for a big, real change and in that case I feel that 12,000 on Dow and 1,300 S&P are the easiest levels to get short on a solid technical signal. I'm still watching for a signal here for a short. A major wide ranging day where we see a 3-4% plunge would be a good signal. There isn't a spike top here like we had on the last tops over the last year. This action the past day is not looking like a major signal. A spike/wide ranging drop day and a gap down should be good technical analysis indicators going forward. Feel free anybody to comment on the economy and valuations and disagree with me. I like hearing all sides to things and I won't bite. I'm really seeing strong bearish signals forming on the Nasdaq. I was going to mention in the previous post that Shanghai has had some major trouble lately to. This is also a small part of why I'm looking to get bearish here. This trade to go short is looking better and better as I look at this chart coupled with valuations. I mentioned before I wanted to see a spike day. I hadn't looked at the Nasdaq percentage loss yet or the chart. Well, there is a decent spike day. In other words a volatile day. It isn't all that nasty a day actually but if you look at some other things I am seeing there is not a good chart here. My red support line shows an internal trend line that touches support 4 times. The buyers and sellers in the market are comfortable with moving prices higher on that trend line. The chart has rising lows. This is bullish. However, it is right on trend line support again here with an ugly shooting star/gravestone candle. It was also a volatile day on strong volume. The resistance trend line shows us that the Naz has been making higher highs to. This was bullish too. But, on that last push the market got the breakout but failed to hold the higher high and continue. You can see it in the chart below. The last time the momentum stalled was about 1,850 and it brought the drop below trend line support. The only drop below it. This last move here is different because it actually made a higher high but buyers immediately got shaken out. This is also a potential double top forming that the arrows point to. I feel like confirmation of the top will be right around 1,900. I plan on getting short before hand though. The fundamentals for a short look good to. I am thinking I want to get a little broad market exposure short with the bear 3 X short Technology ETF (TYP) or another market ETF. I want to enter on any weakness and any break of trend line support. I think the risk reward is good here even if this isn't a major top and we just get another day or two of pull-back. If I swing something the next support level is my profit target. Right above that red confirmation line on the second chart. If we get a big gap down I'll probably be even more bearish. I think I might start doing video and audio charts sometime soon. Keep an eye out for those. And if you get my posts RSS be sure and subscribe to the comments to. I have the widget for that on the right sidebar. There have been some good comments lately. Especially on the Vonage VG post.